The charts of actors tend to reflect the characters they portray. Timothy Olyphant is regularly cast as a hero gunslinger with anger issues and a bit of a "sliding scale" of morality. He has played this role in TV series' "Justified", "Deadwood", the movie "Hitman", and probably a number of other productions in his career. Apollonian: Pallas trine Sun and square Mercury. As per his characters, a very "the end justifies the means" kind of configuration. Leaning toward the ethical/Apollonian but with a very strong Dionysian component. Unaspected Mars: corresponding, pernaps, with the anger issues and somewhat awkward sexuality of his most famous roles. Moon opposite or quindecile Pallas: potential facility in combat. 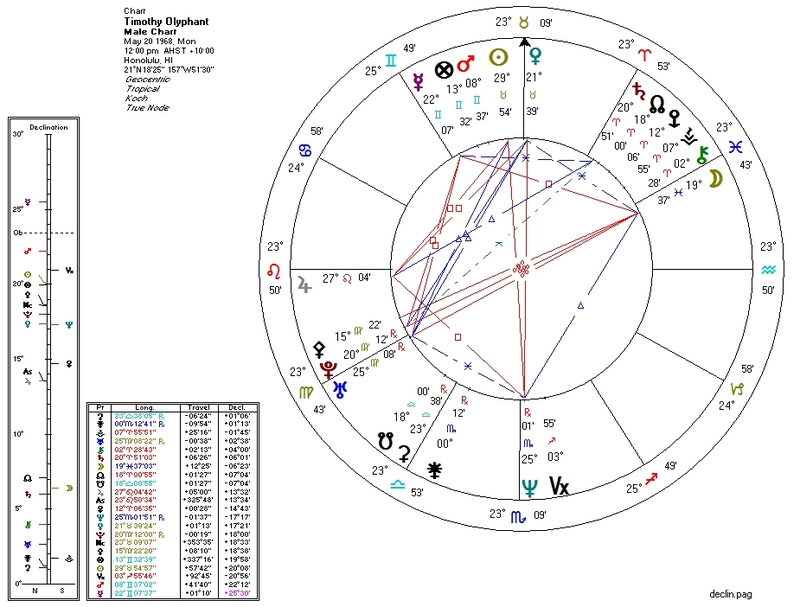 Sun/Jupiter/Neptune T-square: perhaps suggesting a knack for "disappearing" (Neptune) into "public champion" (Jupiter in Leo) roles.